Sciatica is a term that describes symptoms like numbness, tingling and pain radiating down the leg or both legs. This occurs when there’s pressure that pinches the sciatic nerve in the lumbar region of the spine. About 43 percent of the middle-age population will experience this painful condition at some point in their life. 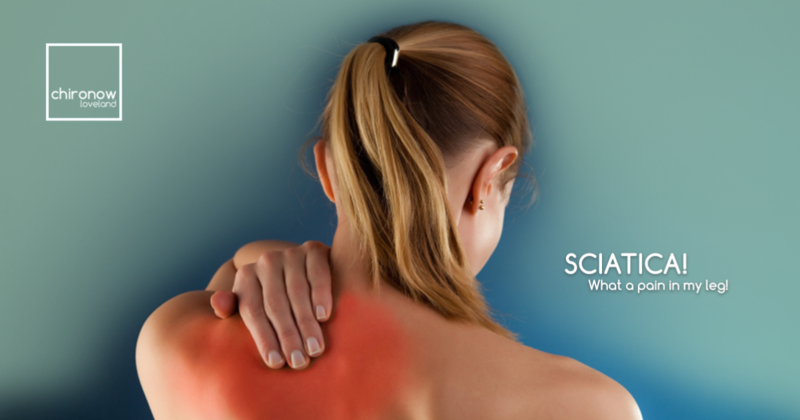 Are you seeking sciatica pain relief in Loveland? Our chiropractor at Chironow Loveland can help. Walk into our office at any time — no appointments necessary. Non-surgical approaches like chiropractic adjustments, stretching and rest can greatly improve symptoms and provide sciatica pain relief. So how do adjustments improve this condition? By getting frequent adjustments, the spine is put back into proper alignment, taking pressure off spinal discs, nerves and muscles. When the spine is in proper alignment, our bodies communicate with our brain, which allows our bodies to heal itself. Painful conditions like sciatica happen all too often because we aren’t taking the time to eat properly, rest, stretch and get adjusted. At Chironow Loveland, we make it our mission to get you back to feeling your best! We know you’re busy, so our clinic offers walk-in services — no appointment necessary. We also know that finances can be tight, so we are offering six adjustments for only $149.99. The whole family can enjoy with NO expiration date! Stop in today!